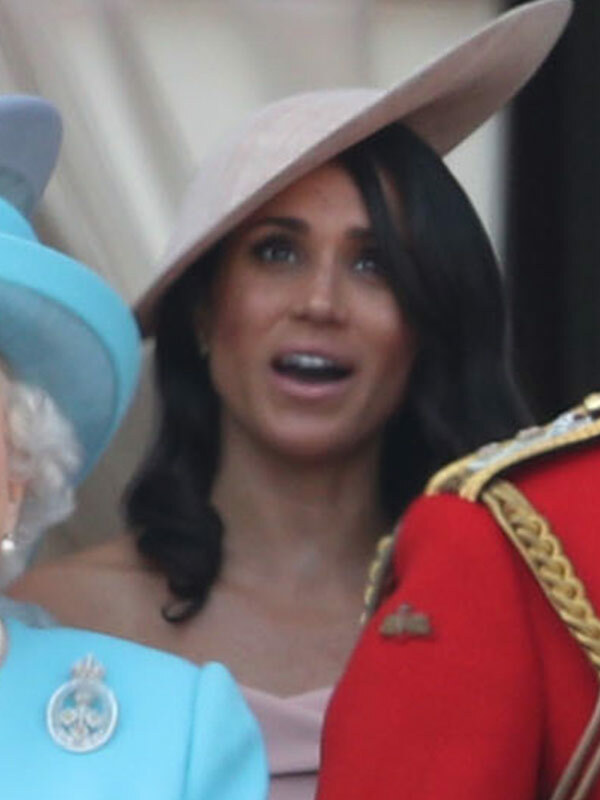 Trooping the Colour 2018: See Meghan Markle on Buckingham Palace Balcony for the very first time! Crowds started gathering at Buckingham Palace from around 7 in the morning and it was well worth the wait with Trooping the Colour well and truly delivering the very best of British Royal pagentary. The celebration, which is the official marking of Her Majesty, Queen Elizabeth's birthday, sees the entire family gather and culminate on the palace balcony. Taking a step out of the Centre room in the castle, fans got a glimpse of Duchess Kate, Prince Harry and newest royal Meghan Markle - who all took a moment to wave at fans on the balcony as they await for the Queen's arrival. Want to know how to watch Trooping the Colour? Now To Love will be covering it live! 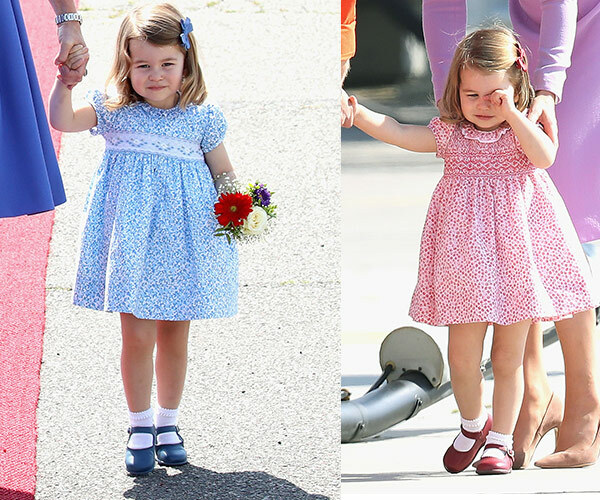 It looks like Princess Charlotte is wearing a similar dress to what she wore when she met her brother Prince Louis for the first time. Catherine comforts her daughter during a loud moment. The family look up to see the fly past. Prince Philip skipped the event this year. 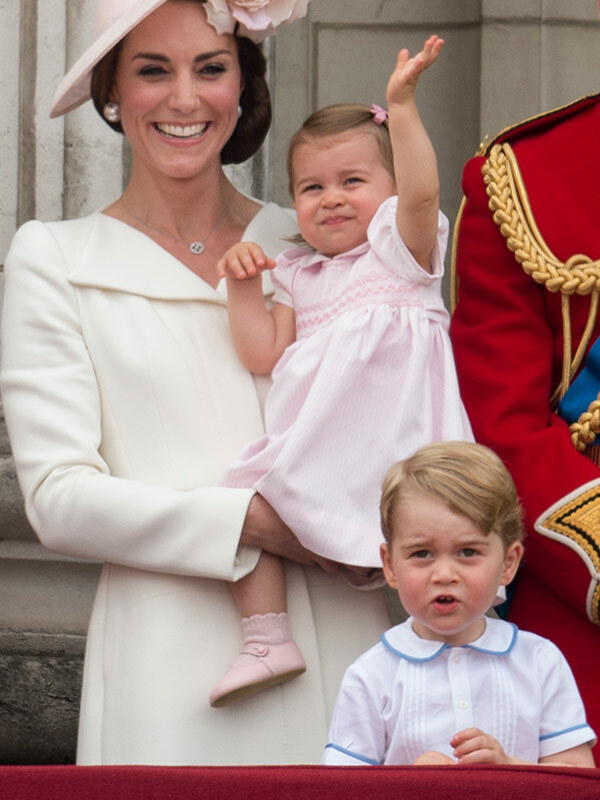 It's official: The Queen's great-grandchildren just stole the show! 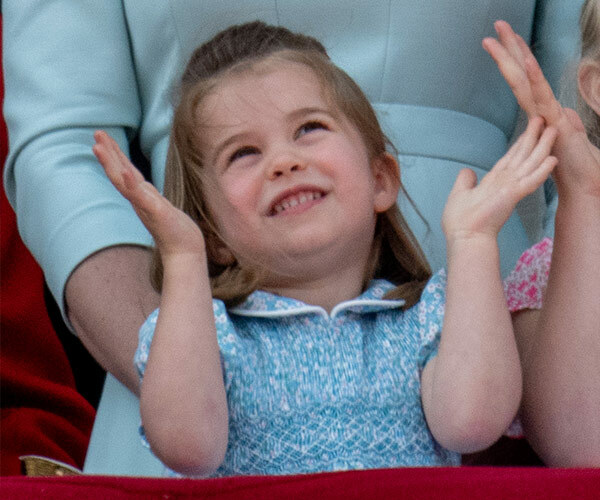 Princess Charlotte looking away as her cousin Savannah Phillips teases Prince George actually has us LOLing. It looks like she's trying to stop George from belting out some very cute vocals. Watch: See that moment in the video player underneath! RELATED: Meet the full (and very adorable) cast and crew of the next generation of royal cuties! That smile makes us so happy! The cousins are clearly very close. And look at that wave. Charlotte matched with her mummy, also wearing baby blue. It hasn't been confirmed but the print does look like something that could have been designed by an old school friend of Catherine's, Alice Avenel. 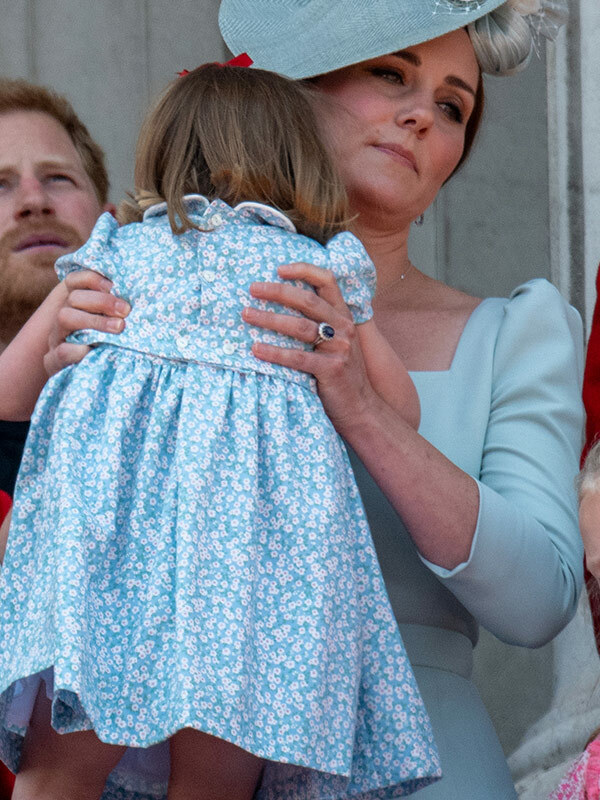 Her pal from Marlborough college created Charlotte's Periwinkle dress under her brand Little Alice London, which she wore when she met Prince Louis. See some of the times she's worn the designer below! 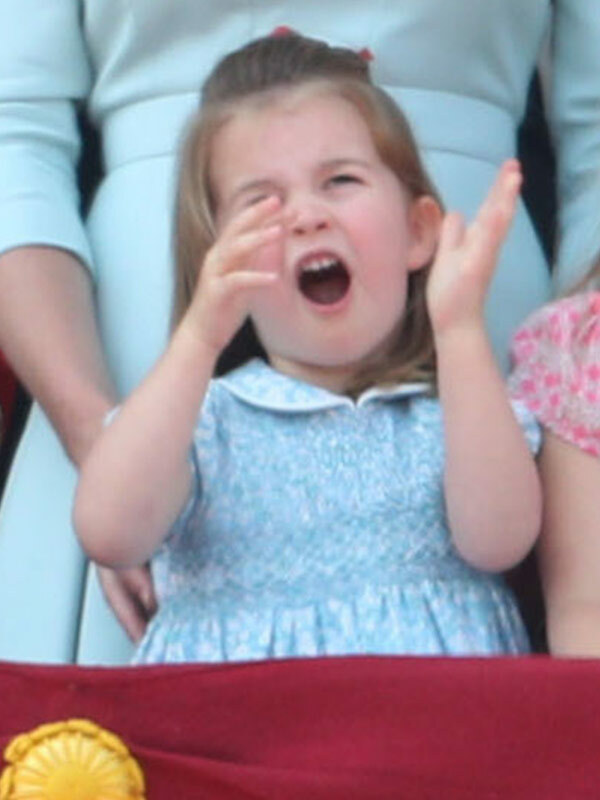 Prince George was darling in his white shirt by British childrenswear brand Amaia with navy blue piping. We saw him in the shirt back in 2016 for Trooping the colour. And if you thought you'd seen the shirt before, then you were right! He wore it in 2016.
Who had the most fun? Meghan or Charlotte? 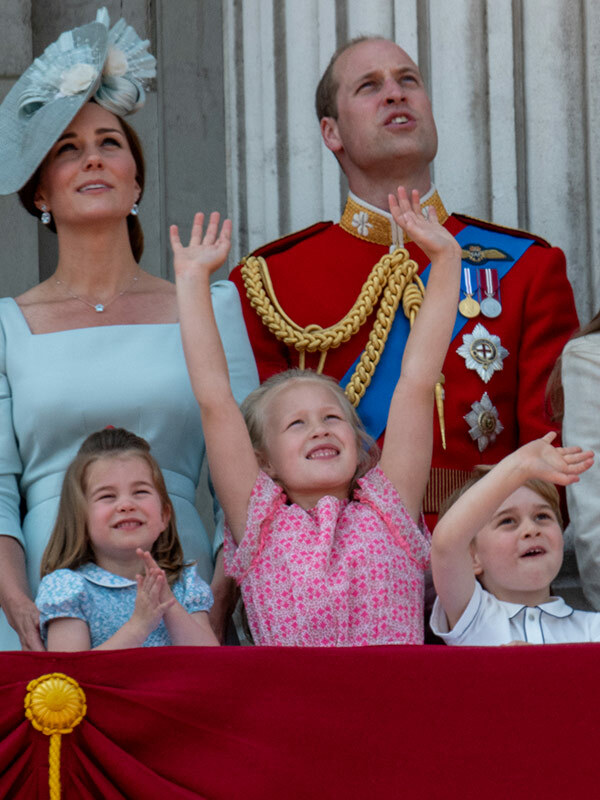 The RAF fly-past is an annual British tradition... We can't tell who was the most impressed? We've seen Queen Elizabeth, Duchess Kate, new royal Duchess Meghan with husband Prince Harry along with the rest of the British Royal family including Duchess Camilla and Lady Louise all ride past in horse drawn carriages. The iconic Brits are awaiting in Buckingham Palace before they can go out onto the balcony to greet fans and watch the RAF fly past. And judging by these snaps - they can't wait to see the iconic procession, taking a quick look outside the palace windows. This is Meghan's first official appearance on the Balcony! It is incredible seeing our favourites out and about. And now we know who's responsible for the curiosity gene in the Cambridge line. Princess Beatrice is in awe of the festivities. We love the colour theme this year. Looking beautiful in pale pastels, Duchess Catherine and Duchess Camilla were the first of the royals to make their way to the Palace. Both women opted to wear pale blue hues, which complimented the birthday girl's pretty bright blue outfit. 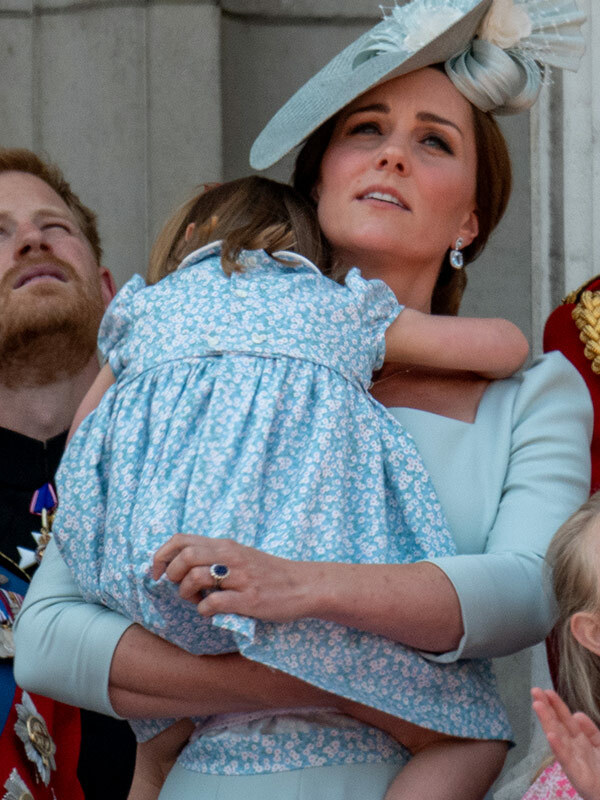 Catherine, who welcomed Prince Louis just two months ago, went with one of her favourite designers - a pastel blue dress created by Alexander McQueen, teamed with a matching hat by Juliette Botterill. Camilla opted for a blue Bruce Oldfield coat and dress. And right behind them were newlyweds the Duke and Duchess of Sussex! Unsurprisingly Meghan, who is often compared to her sister-in-law, went for a completely different look. Meghan is all kinds of Hollywood glamour. Prince Harry and Meghan Markle look very in love as they rode in. 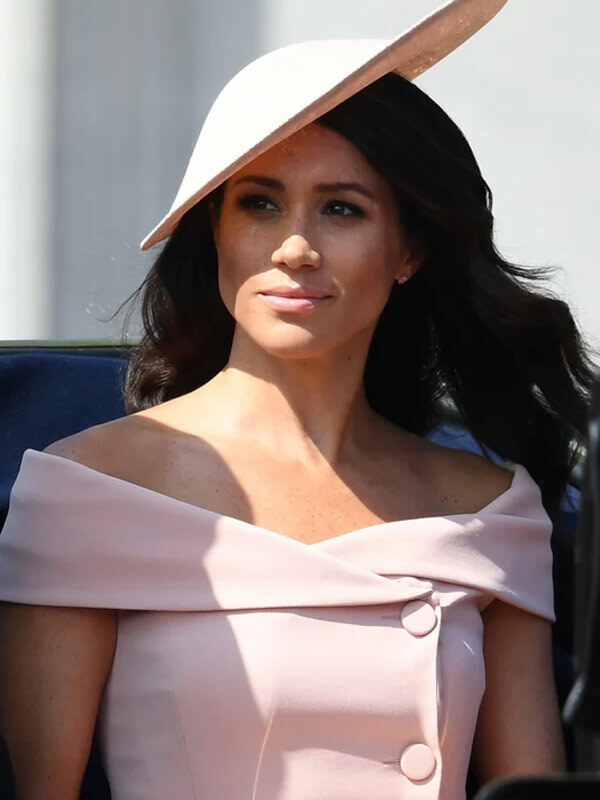 The newly minted royal, Meghan, decided to also stick to the pastel theme, donning for pink hues - her choice for her very first royal appearance after she married Harry. 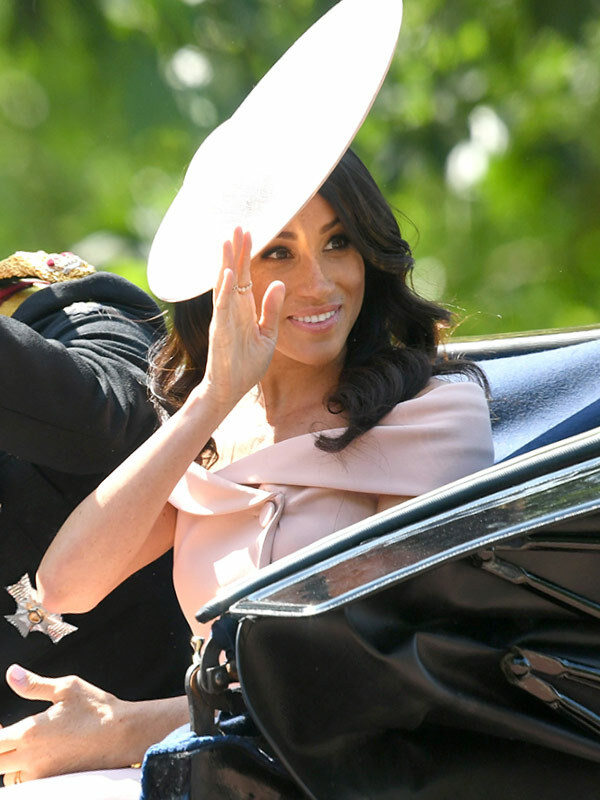 The Duchess wore a pale pink off-the-shoulder dress by Carolina Herrera with a matching hat by Philip Treacy. Harry wore his ceremony uniform of the Blues and Royals. Fans were ecstatic to see the couple - screaming with joy as they got a glimpse of the pair. RELATED: Your one-stop shop, explaining what is Trooping the Colour? Catherine traveled with Camilla and Harry. She's opted to show off her shoulders. Harry chats to his wife. She looks stunning with her peach-hued make up and soft curls. Her Majesty looks resplendent in a bright sky blue outfit designed by Stuart Parvin. The birthday girl, who was actually born on April 21 but marks her milestone officially in June, teamed her outfit with the prettiest matching blue hat that featured a floral arrangement. The accessory was created by Her Masjesty's go-to millinery creator Angela Kelly. Take a look back at all of the Queen's best hat moments! Riding alone seemed to be no problem for the Queen, with her husband Prince Philip deciding to skip the event now that he's retired. Doesn't she make such an impact. Prince Philip may have opted to skip the event for his third time, but the Queen wasn't short of loved ones. Taking charge, we saw Princess Anne and Prince Andrew ride on horse-back. While the Duke of York's daughter Beatrice and Eugenie were in a carriage with Sophie of Wessex and her daughter Lady Louise. The Queen's kids Andrew and Anne. Countess Sophie is a vision in pink. Eugenie will be the next royal to be wed. The annual event will see more than 1,000 soldiers taking part in the traditional display of pomp and pageantry. The colour being paraded this year is the flag of the 1st Battalion Coldstream Guards. Some of the Queen's guards began preparing for this big moment back in April. It's clear the Queen is sending a message of diversity, with 22-year-old Guardsman Charanpreet Singh Lall being the first Coldstream Guards soldier to wear a turban. The 22-year-old couldn't be prouder, saying it is a "new change in history". WATCH: Learn more about Trooping in the video below! Pomp and pageantry in its finest form. The Queen loves this time of year. 22-year-old soldier Charanpreet Singh Lall is the first person to wear a turban during the official trooping parade.